Three weeks ago I had the pleasure of competing in the 2013 ING New York City marathon. It is the largest marathon race in the world. This year, over 50,000 people ran it. The logistics of organizing a race this size is mind-boggling. But New Yorkers are proud and determined to make this race the best experience ever. I can honestly say that they have succeeded. We land at Laguardia airport and take public transportation to our hotel: the Bryant Park Hotel. It’s too early to check in and so we leave our things and walk directly to the Jacob K. Javits Centre for the race expo. We arrive well before the expo opens. The expo space is huge. Things go smoothly; there’s no wait. I get my bib number and race shirt. We take our time visiting each section. We make a few purchases and head back to the hotel. The gentleman behind the counter at the hotel is pleased to tell us that we have been upgraded to a better room with a terrace. Wow! I rarely make a fuss about where we stay but this is worth mentioning here. We open the door and are immediately impressed. The terrace is large; it runs half the width of the building. We sit out on the chairs and munch on some glazed nuts I purchased on our way. 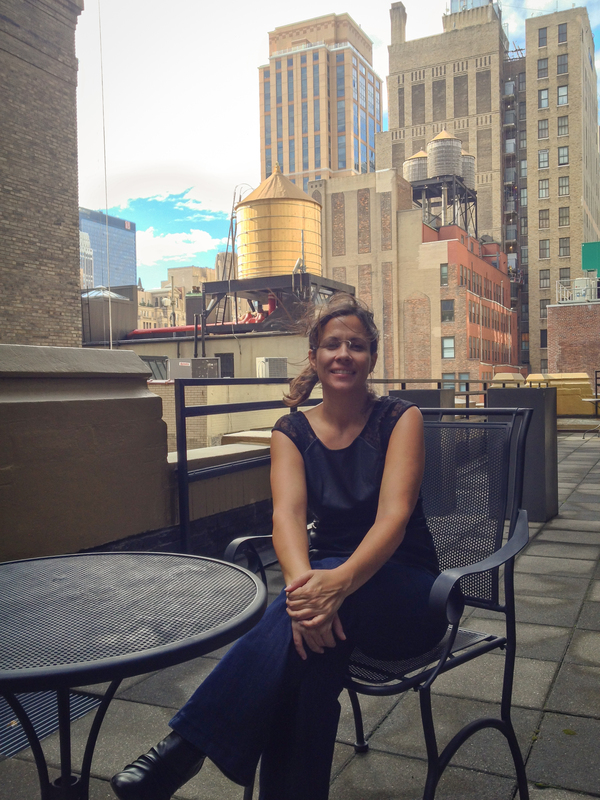 Gen on our 14th floor terrace. 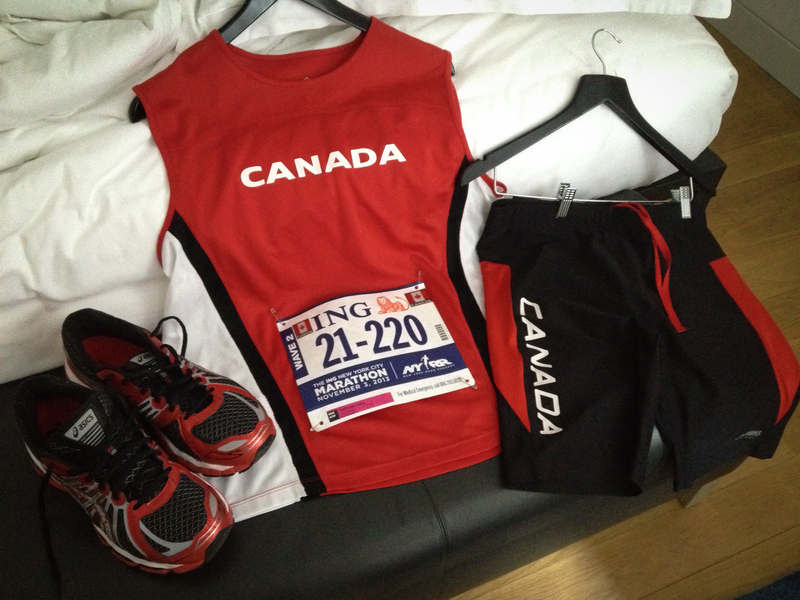 Later, I pin my bib to my race singlet and prepare my things for race day. I always do this a few days in advance when travelling. That way, if I forget something, I can always go out and buy it. And it’s one less thing to worry about. A friend informs us via Facebook that a very special Canadian in the city. Colonel Chris Hadfield is in NYC at the Barnes and Nobles at Union Square to sign copies of his new book “An Astronaut’s Guide to Life on Earth”. He will be talking at 7 pm. We decide to go. At this point we don’t know how busy it will be, but we assume it will be a full house so there’s no guarantee that we’ll see him. It is just after 8 when we enter Barnes and Nobles. We don’t see Chris on the first floor and so we get on the escalator. We are one of many looking for the Canadian astronaut. He’s not on the second floor and so we keep moving up until we reach the top floor. There he is! We have been spellbound by his adventures in space on social media and now here he is, back on earth signing books. We miss his one hour discussion but want to stick around to get his autograph. We ask one of the guards how we go about doing this. We must head back down to the main floor. I buy a book for myself and a bookmark for our friend and we go back upstairs. The guard lets us through the seating area to wait. The whole process is very orderly. I start reading a few pages of the book while we wait. After about an hour we stand up and get in line. I try to think of something to say. It should be smart and funny and… Oh heck! Who am I kidding? No matter what I come up with will be gone the moment I shake hands with him. I decide to keep it simple and play it by ear. I tell Chris that we flew in from Ottawa that morning and that we are in town for the New York Marathon. I add that when we found out that he was here, we just had to meet him! He seems pleased. He says “Ottawa? Wow!” He signs my book then the bookmark. He asks if we both are running on Sunday. Gen answers that she will be a spectator while I’ll be running. He wishes me luck. We pose for a few photos and walk off the stage with big smiles on our faces. 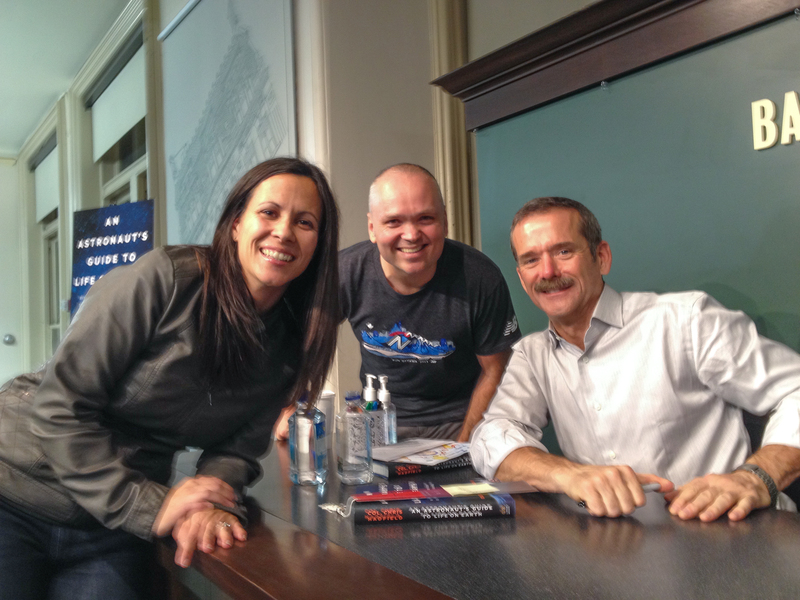 Gen and I meeting Col. Chris Hadfield. What a wonderful feeling to meet such a great Canadian!! We grab a quick bite to eat then head to Times Square. This may be our seventh visit to the Big Apple but we still like to make a stop there even if it’s just for a short time. We walk back to the hotel. We walk into the room and the lamps by the bed are on and there are…. chocolates on our pillows!!! They even took the time to place our complimentary slippers on each side of the bed and they turned on the sound generator to the sound of birds. We could get used to this! The next morning, we eat breakfast in Bryant Park – one of our favorite parks in New York. It’s even warmer than the day before. It’s still t-shirt weather in NYC. We change into our running clothes and off we go to Central Park – one of our favorite places to run! The autumn sun is out and the colours of the leaves on the trees are picture perfect. We couldn’t ask for better weather or scenery. After a few kilometres I notice the back of some banners on the lamp posts placed at regular intervals. I turn around to see what they are. “For the marathon tomorrow!” I say to Gen. “I’ll be running here tomorrow!” I exclaim almost child-like. We run around our favorite spot in the part; the Reservoir. The view of Manhattan is incredible from here. At one point I ask Gen to stop so we can admire the view. The kilometres are adding up and we get close to 8 kilometres. I don’t want to run too much the day before the race. We stop near the Finish line for the race. There are plenty of people here. There’s a reporter and cameraman – they’re shooting some segments for a news report. We walk around and eventually stand at the Finish line. I try to imagine how it will be tomorrow; all the runners and the spectators. I’m excited. We walk out and there are flags of every country represented in the race. I look for the Canadian flag and see it at the “200 Yards Left” sign. On the walk back to the hotel, we stop at two Lindt chocolate shops we pass along the way. Why? They give out a free chocolate truffles to each person who walks in and we need to refuel after the run. The pre-race dinner restaurant of choice for this race is: The Meatball Shop. A recent favorite of ours. Outside, the weather is changing. It’s getting colder. Back in Bryant Park we make our way to a chocolate shop we had seen earlier in the day: Max Brenner. We had recognized the name as we ate at the Max Brenner restaurant in Boston near our hotel. The chocolate is excellent here. We have been waiting several hours for this and now we have one thing on our mind: thick hot chocolate. We each buy a small cup and purchase some churros from a chop a few doors down. Memories of our trip to Spain for Gen and I! We sit at a small table and sip our sweet drink while we listen to music that is being played at the nearby skating rink – classics from the American Songbook. I’m facing the Empire State Building which is just behind our hotel and is lit up in the colours of the marathon; blue, orange and white. It doesn’t get any better than this. We take our time and enjoy the experience. We thought we might take a break from New York in 2014 but we both realise that that’s not going to happen; we enjoy coming here too much. There’s just something about New York. Back at the hotel, I finish getting my things ready for the next day. Tonight we move the clocks back one hour. Because of that I decide to schedule a wake-up call just to be safe. I also set my alarm on my phone. Time to sleep. 5:15 am will come soon enough. I sleep relatively well even if I wake up several times to check the time. I don’t want to get up late. The race morning ritual begins. Today is race day! This entry was posted in Running in New York City, Uncategorized and tagged Bryant Park, chris hadfield, col chris hadfield, Manhattan, Marathon, New York, New York City, New York City marathon, New York Marathon, Times Square. Bookmark the permalink.